Note: We’ve updated these data in a December 2015 report that extends the analysis of the Washington press corps into 2015. In doing so, we re-analyzed some of the data published in this report, electing to make slightly different classification decisions for trending purposes. Notes are added below where applicable. Read the headlines and it would be easy to conclude that as the new Obama Administration takes power, facing an array of domestic and international crises, it will be monitored by a substantially depleted Washington press corps. The corps of journalists covering Washington D.C. at the dawn of the Obama Administration is not so much smaller as it is dramatically transformed. And that transformation will markedly alter what Americans know and not know about the new government, as well as who will know it and who will not. A careful accounting of the numbers, plus detailed interviews with journalists, lawmakers, press association executives and government officials, reveals that what we once thought of as the mainstream news media serving a general public has indeed shrunk—perhaps far more than many would imagine. A roll call of the numbers may shock. But as the mainstream media have shrunk, a new sector of niche media has grown in its place, offering more specialized and detailed information than the general media to smaller, elite audiences, often built around narrowly targeted financial, lobbying and political interests. Some of these niche outlets are financed by an economic model of high-priced subscriptions, others by image advertising from big companies like defense contractors, oil companies, and mobile phone alliances trying to influence policy makers. In addition, the contingent of foreign reporters in Washington has grown to nearly ten times the size it was a generation ago. And the picture they are sending abroad of the country is a far different one than the world received when the information came mainly via American based wire services and cable news. ClimateWire, an on-line newsletter launched less than a year ago to cover the climate policy debate for a small, high-end audience, deploys more than twice the reporting power around Capitol Hill than the Hearst News Service, which provides Washington news for the chain’s 16 daily newspapers. Or consider that the organization with the largest number of journalists accredited to the press galleries Congress is CQ, a news operation that produces an array of on-line and print publications with names like CQ Budget Tracker and CQ Senate Watch. Its 149 reporters eclipse the number of Hill-accredited journalists at the Associated Press (134) and congressional staffers dealing with accreditation say CQ has since surpassed even the hometown Washington Post in numbers. A decade ago, CQ had 40. Collectively, the implications of these changes are considerable. For those who participate in the American democracy, the “balance of information” has been tilted away from voters along Main Streets thousands of miles away to issue-based groups that jostle for influence daily in the corridors of power. These are the conclusions of a three-month study conducted by the Pew Research Center’s Project for Excellence in Journalism and journalist Tyler Marshall on the scale, scope and nature of the Washington press corps at the beginning of the new administration. Marshall conducted the research and reporting. The report was written by the Project and Marshall jointly. A significant decline in the reporting power of mainstream media. The poster child of this trend is the daily newspaper, historically the backbone of American journalism, whose robust Washington presence and aggressive reporting has uncovered scandals that toppled a president, sent members of Congress to jail and does the daily job of covering congressional delegations and federal agencies. 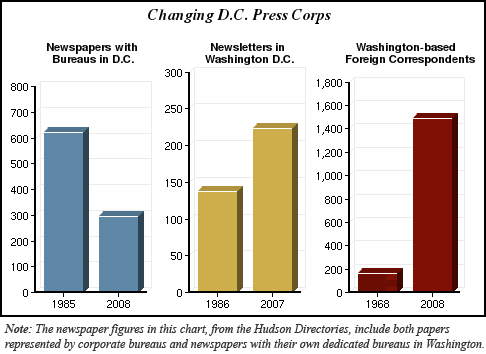 From the mid 1980s to 2008, the number of newspapers with bureaus in Washington, according to Hudson’s Washington Directories, has fallen by more than half. In the last decade (1997 – 2009, with numbers updated to include the 2009-2010 session), the number of newspaper reporters accredited to cover Congress in particular has fallen by 30%, according to Congressional Directories. The decline in mainstream press has been nearly matched by a sharp growth among more narrowly focused special interest or niche media. The number of specialty newspapers, magazines and newsletters has risen by half since the mid-1980s. Newsletters alone are up nearly two thirds. And from 1997–2009, the number of staff from these outlets accredited to cover Congress, a count of Congressional Directories shows, grew by nearly 50%. A marked jump in foreign media now represented in Washington. When the U.S. State Department first opened a Foreign Press Center for representatives of non-U.S. media in 1968, there were about 160 foreign correspondents reporting from Washington. In October, 2008, there were nearly ten times as many. With some notable exceptions, this growth has been more a broadening than a deepening of coverage to international audiences. Foreign journalists tend to fare poorly in the fight for access to key federal government decision-makers and consequently, they break few important stories. Still, their presence in such large numbers has changed the way the world gets its news from Washington, and the implications of their presence for America’s image in the world are considerable. The shift from media aimed at a general public toward one serving more specialized and elite interests also comes as important parts of the federal government—most notably arms of the executive branch—have become more circumspect, more secretive, and more combative in their dealings with the media. As a result, the traditional—and natural—adversarial relationship between the media and the federal government has hardened perceptibly at a time when the mainstream Washington-based media has weakened. Symbolic of the state of this relationship, George W. Bush is the first president since Theodore Roosevelt not to address the National Press Club during his years in office. 1. The updated material relates to the numbers of reporters and news organizations accredited to the Senate Press Gallery, figures referenced in the first bullet of the report and in the section entitled The Numbers. 2. This means accredited to cover the 110th Congress, whose term concluded at the end of 2008. 3. The Pew Research Center’s 2015 report on the Washington press corps compares the number of newspapers with a Washington bureau and the states they represent between the years of 2008 and 2015. The newer report uses a broader metric to track the changes over time, including a larger number of newspapers in the tally. Those numbers can be found here.